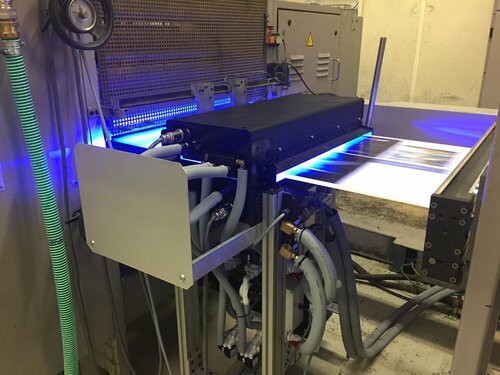 ZURICH, Switzerland — AMS Spectral UV – A Baldwin Technology Company reports that Kyburz Druckerie of Zurich, Switzerland has retrofitted an AMS LED-UV curing system onto its MAN Octoman commercial web press, replacing the former drying system and making it the first press configuration of its kind in the country. Installed with the support of AMS distributor Chromos AG, a video of the press running shared by AMS on its facebook page garnered more than 14,000 views in a week, showing that people around the world remain interested in the printing process, and how the printed works in their everyday lives are created. Koni Kyburz: We knew that Chromos was an experienced LED provider, and we were the first printing company in Europe to use LED-UV curing for a sheetfed offset press printing in A1 format – it was a success for us and our customers. In 2016 the first AMS LED-UV system on a large web press was installed in Tokyo, and we had a chance to visit the facility and run test prints before deciding to retrofit our MAN Octoman with this future-oriented technology. Heinrich Maag: How did seeing the technology in Tokyo convince you? Kyburz: We specialize in exclusive finished products, and knew the possibilities of LED-UV curing would be a huge advantage for us … the speed, the ability to start and stop instantly would help get maximum performance from the press. We saw there would be less waste, and that inks would cure in a millisecond, nail-hard, without drying the paper … and no plates, no worrying about wave formation … not to mention the quality we could achieve on natural papers – that of high-quality UV varnishes and metallics – all with odorless printing. Maag: Kyburz is known as a pioneer in the printing industry; what are your reasons for switching to LED-UV drying with rotary printing? Kyburz: Innovation is a dynamic, active and lively process – standing still means an early end! For us it seems an existential question, as a pioneer in our business. Nobody wanted to tackle LED-UV for web … we decided to be daring, and this attitude is why our business is still here. The conversion has brought us further … and the production reliability and fast process initially convinced me. Sheetfed printers who use LED wouldn’t go back to the old way … powder needed between sheets so they don’t stick together? No thanks! In rotary printing, LED is for us an exclusive blessing. The complete conversion was tough, but now we can say the effort paid off – we’ve never had such high quality and productivity. By removing the old giant hot air dryer, we have more space for further refinements. Maag: Were you worried about any safety risks with LED-UV? Kyburz: From an environmental protection point of view, UV technology is among the cleanest applications. It offers optimal hardening of the paint dimensionally – and completely dried UV inks aren’t a health risk. UV technology is used in very demanding applications, like food packaging. Maag: How does this work with LED-UV? Kyburz: With LED-UV, photoinitiators included in each ink must be precicely adapted to the wavelength of the LED radiation, without being affected by daylight (which would cause the ink to dry prematurely). LED-UV enables immediate drying and curing of each color. Maag: When did your “testing” of LED start? Kyburz: Sometimes resistance to “something new” is ample, but our team’s enthusiasm is quite great after our initial successful conversion to LED [on the other press]. We were able to have a good opportunity to test LED in this application in November 2016 – and as planned, we converted our Octoman this year. It took one of our most capable employees, Albert Gachter, who is a true printer in body and soul. To him I owe a huge thank you. Maag: How long have you exclusively been printing using LED-UV on the MAN press? Kyburz: Since March 29th – we consider it a historical day for our company. The hot air dryer had officially worn out, and now the advantages in quality and production with LED can fully be utilized.